Since dried mud is compacted in the grooves that make up the inscription of CJO 704 (IAA 80.503) YESHUA (?) BEN/BAR YEHOSEF, the staff of UHL proposed cleaning the mud from the inscription in order to define the tools used in various parts of the inscription and to clarify the order of the succession of strokes that make up the letters. We also proposed making enlarged digital images of the strokes in order to understand the nature of the engraving process and the tools that were used. To make tests on removing the mud UHL enlisted the aid of one of Jerusalem’s leading dentists, Dr. Ari Greenspan D.M.D., who also has applied his skills and scientific background on various projects with UHL and other archaeological endeavors in Israel. 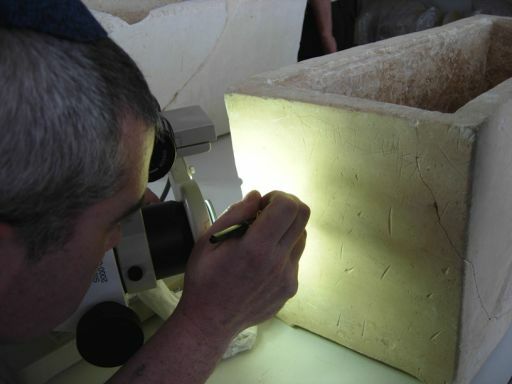 Initial tests with an industrial water pick and irrigator were carried out on broken shards from ossuaries and then on scratches on ossuary 80.503 which were not part of the inscription, with the collaboration of Steven Cox from UHL and Oded Raviv from the IAA. It was concluded that the industrial equipment would be unnecessary for the task since the dried mud softened with a light spray of distilled water. A fine, soft-tipped probe would likely be best used to then remove the mud. This less aggressive procedure should be effective and would protect the fine layer of patina that covers the side of the ossuary and the patina that presumably lines the walls of the grooves which make up the inscription. You can read more about his work by linking over to: Jerusalem Dentist.